… so Ryanair’s slogan says. When it comes to traveling with kids, airlines have specific family travel policies, especially regarding the carriage of equipment and seating. 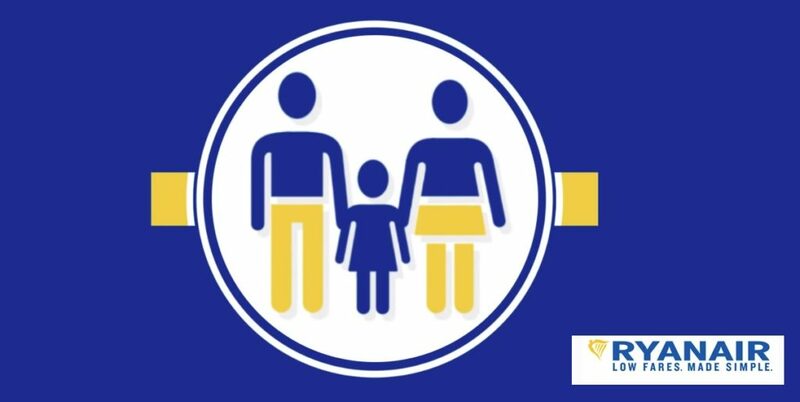 If you are travelling Ryanair with your baby or kids, it is worth reading their family travel policies beforehand. Or let us at Stork Exchange help! Olivia Mai examines Ryanair’s family travel policies and explains how to really keep it simple. Ryanair’s Family Policy are far from ‘SImple’! You can bring two pieces of baby equipment free of charge, a pram and either a car seat or a travel cot. Customers have regularly asked us if they can ‘swap’ the buggy for something else, like a scooter or highchair. Try it at your own risk. One mother brought a trike in lieu of her buggy and had to pay the ‘additional item’ charge at the airport. The website is very specific. Ryanair charge ‘Additional Items” at €15 per item, each way, and it must weigh less than 20kgs. There is no additional cabin or checked baggage allowance for infants traveling on their parent’s knee. However, parents may bring a 5kg baby bag for free in addition to their own luggage allowance. A baby bag is essentially your nappy bag, with your bottles, soothers, nappies etc. You can bring a fully collapsible buggy to the gate. By “fully collapsible”, Ryanair mean a buggy that collapses in one piece ideally. If there is a carrycot or separate seat attachment, they prefer you to check that in. (Note, this still counts as one of the two free pieces of equipment.) I recently saw the “fully collapsible” rule enforced. Ironically, the woman had an umbrella stroller, she had just overloaded it with bags and coats.The Ryanair boarding agent gave her a very hard time about it. Ultimately the boarding agent allowed her to board, but he refused to help carry the buggy down the stairs. My sister had a similar experience with her double buggy. She was travelling alone, and she had to bring the twins, her bags and the buggy down the stairs herself. Regardless of whether you bring your buggy to the gate or hand it over at check in, have it tagged! It is better to have it recorded on the flight manifest. Fully collapse your buggy before boarding. You really don’t want busy ground handling staff trying to figure it out! In addition, Ryanair also recommends on their website, that you use a pram bag. I’d agree; a padded bag will prevent a certain amount of damage, and allows you to keep all the bits and pieces together. Moreover, there is nothing to stop you adding some extra “padding” in the form of jumpers or towels etc. They will help protect your equipment, and coincidentally lighten your other bags! ! Have a look here at some car seat and pram bags. 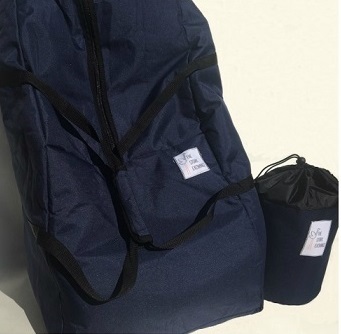 Use pram and car seat protectors and bags, such as this one pictured. Let’s be honest, airlines don’t encourage you to bring your car seat on board. They are bulky and can only fit in certain seats. For any airline, the car seat must be FAA or TÜV-approved, or have a “Certified For Use In Aircraft” sticker. This is partly because the lap belts on airplanes are unsuitable for securing some car seats. Ryanair also require the seat to be forward facing, have a 5 point harness and be 42.5cms at its widest. If you intend bringing the car seat on board, you need to phone their call centre to make the booking as you can only book certain seats. If you are checking the car seat in, as mentioned, use a protective bag and have it tagged. On arrival always check under the cover of the car seat for cracks or damage. Child seats are inherently unsuitable for air travel, they are a piece of safety equipment and the risks any undetected damage can bring are not to be imagined. In the event the airline mishandles your car seat or buggy, look here for tips on what to do. Ryanair recently updated their seat allocation policy. An adult traveling with a child under the age of 12 must purchase a seat (at a reduced rate, starting at €4 each way). The child will then automatically be seated beside them for free. This also allows you to check in 60 days before the flight, which is handy! Up to four children will receive the free seat allocation per one adult. 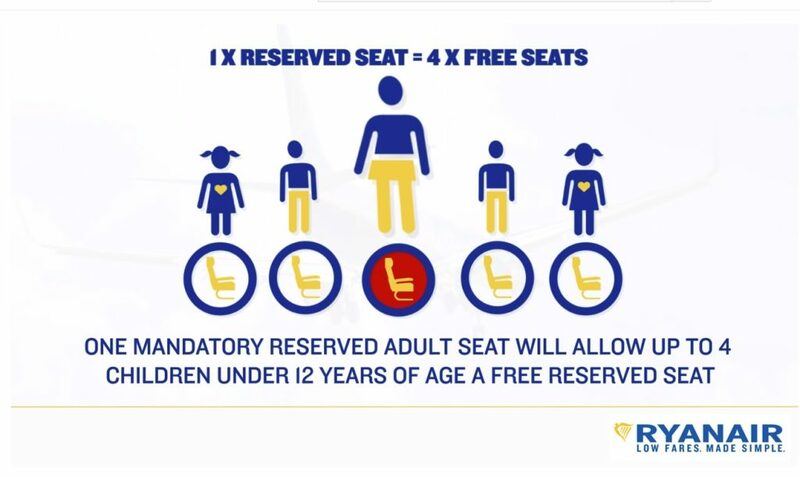 The free seating is from row 18 – 33 only, outside of these rows a child will be charged at the full rate. If there are no ‘free’ seats available together, you are requested to pay the difference. If you have to change your tickets and the same seats are not available and/or cheaper, you will not be refunded the difference. This is Ryanair folks! A child under the age of two may travel on your knee. However, if you book an extra seat for said child then you are required to have either an aircraft approved car seat or the Cares Amsafe Harness. Ryanair do not provide either. You can buy the harness on sites like Amazon, or you can hire a harness from us at The Stork Exchange! There’s a lot of information on Ryanair’s website if you dig around. In my view, their family travel policies are not all that simple or straightforward! Yet, once you play by their rules, they are budget friendly and efficient. So, in the spirit of the airline I’ll try and ‘simply’ sum it up. You can bring 2 free items and a baby bag, bag them, tag them and check them for damage in the arrivals hall. Book your seats well in advance too, if you want to avoid additional fees! That’s it!